A tea party leader and a conservative state lawmaker are behind a petition to make solar panels more profitable in Florida, reports Ivan Penn of the Tampa Bay Times. The group is collecting signatures to place a constitutional amendment on the ballot that would allow residents to sell electricity generated from the sun directly to their neighbors, tenants and friends, instead of giving the utilities a cut. For conservatives, solar power is a chance to put an end to state-regulated monopolies in electricity and create an opportunity for investment for every homeowner. Dooley said the reason the solar efforts have been successful in Republican-dominated areas is that opening up the free market and giving people choice is a core conservative principle. "Conservatives will be out front on this to give Floridians choice and a voice," Dooley said. "All too often, the only voice that is heard is the voice of these very powerful and deep-pocketed monopoly utilities." The price of electricity in Florida is cheaper than the national average, so maybe the state's tea partiers aren't making much money on their solar panels yet. But while we're used to hearing Republicans in Congress argue that climate change could be beneficial, it's worth remembering that a surprisingly large minority of Republicans are environmentalists. Some 32 percent believe protecting the environment is more important than improving the economy, according to a Gallup poll conducted last year. 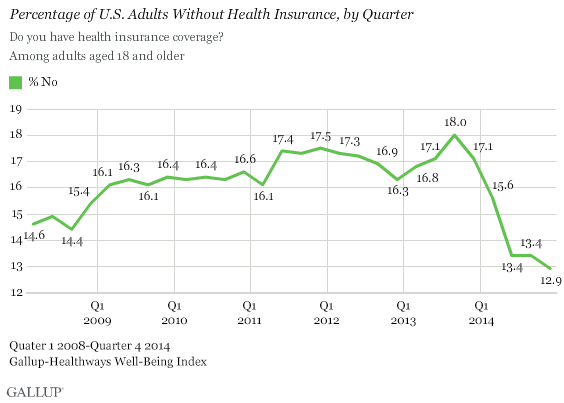 The share of Americans without health insurance has declined below 13 percent, from 18 percent in 2013. Gallup. The chairman of the Federal Communications Commission argued in favor of classifying broadband as a utility. In a speech at the Consumer Electronics Show in Las Vegas, Tom Wheeler suggested that a section of the law designed for utilities, known as Title II, would protect consumers best. He argued that by exempting cable companies from some rules -- such as the requirement to seek regulatory permission to raise rates -- the government could encourage investment. Jon Healey in the Los Angeles Times. This is a reversal for Wheeler, who said one of his previous proposals was unworkable. The chairman's original plan, to allow Internet service providers to negotiate with firms to provide better service to some as long as the deals were "commercially reasonable," would not have protected consumers and entrepreneurs, he said. He also said he had begun considering Title II regulation long before President Obama argued for it in November. Brian Fung in The Washington Post. G.O.P. lawmakers and the cable industry will try to preempt him. Republicans say they are working on legislation that addresses concerns about fairness with a less intrusive regulatory approach, while industry representatives argue Title II is outdated and would make it less profitable for cable companies to improve their networks. Tony Romm at Politico. LEE: Net neutrality should be up to Congress, not Wheeler. Title II is out of date, and even supporters agree that many provisions are simply too intrusive and would make the Internet less dynamic and flexible. What's more, such an important question of policy should be decided by elected officials, not appointees. Vox. 11/14/14. Net neutrality rules shouldn't take us back to the days of Ma Bell. AT&T was a monopoly created by Title II that never invested in better service and avoiding using new technology, because the company couldn't keep its profits. Andrew Kessler in The Wall Street Journal. 11/10/14. YGLESIAS: Raising the employer mandate threshold would discourage work. By increasing the number of hours that employees must work before they qualify for health insurance from their employer to 40 from 30, Republicans would give firms a reason to cut their full-time workers' hours slightly, which means Americans would work less. Owners, meanwhile, would make more in profits and pay less in benefits. Vox. CARNEY: Just because you don't pay income tax doesn't make you a slacker. Take a family with five children earning $80,000 a year. They probably don't pay a penny in federal income tax. The Washington Examiner. ZORNICK: Sen. Elizabeth Warren lays out an agenda. Speaking at an AFL-CIO conference, the Democrat from Massachusetts laid out her differences with the Democratic establishment. The economy hasn't improved enough for the middle class, the big banks need to be broken up and free trade will set back the American worker. The Nation. CHAIT: Republicans declare war on math. The dynamic scoring rule, as adopted, simply imposes conservative assumptions about economic policy on budgetary accounting. The Congressional Budget Office will lose its hard-won credibility as a result. New York. Terrorism risk insurance is a gift to corporations. By voting to reauthorize the federal program. lawmakers are showing they don't truly believe in the free market. The Wall Street Journal. The minutes of the Federal Reserve's December meeting show central bankers discussing instability abroad. In an unusual move, they nudged their counterparts in foreign countries to take action. The European Central Bank is expected to launch a new bond-buying program to shore up confidence in the economy later this month. Jon Hilsenrath and Brian Blackstone in The Wall Street Journal. Primary source: The minutes. Policymakers "regarded the international situation as an important source of downside risks to domestic real activity and employment." The Fed told the Europeans what to do, without actually telling them what to do. Central bankers couched their wishes for European policy in terms of the expectations of unidentified investors. The Fed always avoids the appearance of meddling or interfering in other countries' affairs, but that they felt the need to say something is a sign of how serious the situation has become. Michael J. Casey in The Wall Street Journal. Meanwhile, across the Atlantic, prices are now falling. The latest data show consumer prices down 0.2 percent for Europeans last month, largely due to cheap oil. Europe's slow-motion crisis is also driving down interest rates in the United States. Matt O'Brien in The Washington Post. U.S. Steel laid off 756 people this week. The company said declining oil prices are discourage drilling companies from buying its steel pipe. It's a dramatic example of how economic conditions abroad could make life miserable for Americans. Len Boselovic in the Pittsburgh Post-Gazette. Twelve people were shot dead at the offices of Charlie Hebdo, a satirical magazine. Those killed included the magazine's senior editor and several of France's most well-read and irreverent cartoonists. One of the three suspects, a Muslim extremists known to French intelligence, surrendered after escaping, while the other two remain at large. Dan Bilefsky and Maïa de la Baume in The New York Times. JUAN COLE: The terrorists knew they would embolden the French right. That was their goal. The men spoke fluent French and were almost certainly aware of the political situation. They probably hope that while most French Muslims aren't interested in jihad, by provoking non-Muslims into treating Muslims badly, violent fundamentalists can more easily recruit Muslims into "a common political identity around grievance against discrimination." Informed Comment. DOUTHAT: We need blasphemy. A liberal society depends on the freedom to offer opinions that offend some of its members. "If a large enough group of someones is willing to kill you for saying something, then it’s something that almost certainly needs to be said, because otherwise the violent have veto power over liberal civilization, and when that scenario obtains it isn't really a liberal civilization any more." The New York Times. WILKINSON: Other outlets should publish the cartoons. Cartoons have always had a special ability to deflate the murderous pomposity of the powerful and deluded, but describing them in prose renders them harmless. "To describe the cartoons, and not show them, is essentially to do the bidding of the terrorists." The Economist. What are your intentions, young man? Marriage increases the chance that people will be happy in life, even controlling for pre-marriage levels of happiness. Claire Cain Miller in The New York Times. Will crime increase in New York, now that police have stopped making arrests? If it increases, then police will appear to have sacrificed public safety over a political grievance. If it declines or remains steady, the "broken windows" theory of aggressive policing will be undermined. Emily Badger in The Washington Post. Obama is lowering fees on federal mortgages. The cut will save the typical homeowner $900 annually. Critics argue it will encourage people who don't have the money for a mortgage to enter the housing market, raising the odds that taxpayers will take losses if they default. Dina ElBoghdady in The Washington Post. He's also issued more veto threats. Obama would not sign bills that would increase a full day of work as defined for purposes of health-care reform to 40 hours from 30 hours, or that would delay the Volcker Rule. David Espo and Nedra Pickler for the Associated Press. The Environmental Protection Agency will delay a major rule on coal-fired power plants. The restrictions on greenhouse gas emissions for new plants was to be released Thursday, but will now be released this summer, at the same time as the rule for existing plants. As a result, Republicans in Congress will have to wait several months if they want to use procedural tactics to challenge the rule. Timothy Cama in The Hill. Scientists believe they've discovered a powerful new antibiotic. Since they aren't profitable and are difficult to study, antibiotics are rarely developed, but this new compound could have a profound effect on health around the world. It cured mice of drug-resistant tuberculosis without causing side effects. Human trials are still years away. Rachel Feltman in The Washington Post.